Archetype’ seems rather an old-fashioned word, perhaps implying a standard to be referred to, a seeing beyond what is immediate and real. It means the first impress and was used of coins, to signify the standard to which individual coins could be compared. In the Comparative Anatomy debates of the nineteenth century it was used to mean the assumed ideal pattern of the fundamental structure of particular general kinds of living being – vertebrates, say – of which the individual species are considered as modifications. Note that in using words such as ‘assumed’ and ‘considered as’ I am implying that the archetype is an intellectual aid in classification and comparison. In this essay I will try to indicate why I think the idea of a human archetype has more substance, more to offer us, than just a way of bringing order into a diversity of particulars. I think of it as adding depth and vividness to the experience, particularly, of the human being for the very reason that the essence of being a human being is to be individual, to be unique. That uniqueness gains in meaning, for me, through the living understanding we have of the human archetype, of something universal which is embodied in each unique individual. The question of ‘the archetype’ becomes more pressing if we turn our attention to the scientific investigations of the German poet Johann Wolfgang Goethe, a man of wide interests who did work, acknowledged as significant by the world of science, in anatomy, botany, geology and optics. Goethe was convinced his perspective, which could be called artistic, could lead to the integration of knowledge. Early in life he had predicted that a bone could be found in human beings (which had not been identified previously) because other vertebrates possessed it. It belonged to the archetype. And it was there. Some six years after this discovery, when he was thirty, he published a short pamphlet which attempted to explain (this tentativeness was in his title) or discover the unity inherent in the plant world, to find the archetype. But what is the reality of this archetype? Stephen Jay Gould (ELP, [p153), in a sympathetic appreciation of Goethe’s scientific work, calls it “an abstract generating form”, which suggests it is to be seen as more than a morphological description. Goethe seeks the archetype of the plant becoming manifest in the transformations of the individual plant, as the different parts – leaf, sepals, petals, pistils, stamens, fruit – appear. An archetype – which Goethe identified in the leaf – enables him to understand the growth of the plant as not just growth, and not just growth given shape by cyclical or rhythmical principles, but as growth and cyclical change of a stable element which is more, much more alive than an intellectual abstraction, or a rule or principle. Goethe did call it a principle but in a famous letter to Herder, the philosopher, in 1787, when he was developing his thoughts, he said, “The archetypal plant as I see it will be the most wonderful creation in the whole world, and nature herself will envy me for it. With this model and the key to it, one will be able to invent plants… plants which even if they do not actually exist, nevertheless might exist and which are not merely picturesque or poetic visions and illusions, but have inner truth and logic” (quoted in ELP, p 160). I have said the artist in Goethe sought unity, but his investigations in nature, I think, were helped by drawing, as he himself says. Drawing kept his thinking close to nature, close to the individual plant he was seeking to understand through his hand and eye. The archetype brings together the individual instance, and instant, with something universal. I am reminded here of John Ruskin, who in the Preface to his manual of drawing The Elements of Drawing (1857), writes that his aim for the pupil is “his seeing truly. For I am nearly convinced that, when once we see keenly enough, there is very little difficulty in drawing what we see; but, even supposing that this difficulty be still great, I believe that the sight is a more important thing than the drawing, and I would rather teach drawing that my pupils may learn to love Nature, than teach the looking at Nature that they may learn to draw”. So the artist is open to the wholeness and receptive to what she is seeing: the wholeness is experienced in the immediacy of the part, of the particular. Making things visible is of key importance. You go beyond what is normally experienced through the senses, especially sight, but you stay with what you are seeing, not standing back, or going beyond, via the intellect. It is bringing sensation, perception and thinking closer together. So the archetype, for Goethe, is not a generalisation, it is the whole recognised in the part, and allowing the part to be seen truly. This way of thinking and seeing, living in the relationship between parts (and particulars) and a whole comes to see relationships as being as real as the elements which we identify as being in relationship to one another. Normally, with our analytical consciousness, it’s the things that matter. If we become more receptive, more open to the way some whole, some depth of reality, is working together with the particular expression we are aware of now – then relationships between things start to shine out more. This will show itself particularly strongly in the experience of motion and action. I will quote from the comprehensive investigation of Goethe’s scientific mind, Henri Bortoft’s The Wholeness of Nature: “Imagine cutting an orange, for example. We see the knife and orange simply as separate entities which are brought together externally in space and sequentially in time. But another way of experiencing this is possible, which is entered into by giving attention to the act of cutting the orange, instead of the separate entities which are brought together. If this is done, the process of cutting can be experienced simultaneously as one whole, as if it were one present moment instead of a linear sequence of instants. Similarly, if we watch a bird flying across the sky and put our attention into seeing flying, instead of seeing a bird which flies… we find that our attention expands to experience this movement as one whole that is its own present moment” (p 64). It is important, for me, to see that an interest in the archetype is not simply a continuation of the preoccupation with the “ideal type” that concerned both Plato and beauty contests, any more than it is a kind of abstract average. Such ideal types imply fixity, and that reality is not found in experience. At the other extreme is the biologist who sees the individual organism as interesting only as part of a population which shows variation among the individuals composing it. You can focus on the ideal type, or alternatively, you can look just at the way the different bits or an organism help it to fit into an environment. As a third way The Goethean Archetype is giving attention to the form or structure of the organism as something not purely determined by the environment. If you can expand analytical consciousness you will arrive at a sense for the organism as a whole, which belongs together with its home. I want now to ask you to look at the work of two sculptors who were active in the twentieth century, Alberto Giacometti and Henry Moore. Both of them have affected me deeply and I find insight into the reality of the human archetype through their work. I want to focus on Giacometti’s sculpted figures, often small, the women typically motionless, attenuated, tall and thin in their proportions. He was an artist never satisfied that he had found the reality of the world; he would work away at his figures until they disappeared into dust. Time and again he spoke of trying to work his way through to reality – “we never see things, we always see them through a screen” (AG, p 141) and he identified the focus of his figures, as he worked, as closing in from the head to the gaze to the eye itself. “I don’t think directly of the gaze, but of the very shape of the eye… yet the difficulty to truly express this ‘detail’ is the same as that of rendering or understanding the entirety. If I look at you from the front, I forget the profile. If I look at you in profile, I forget the front view. Everything becomes discontinuous. That’s the truth. I no longer manage to capture the whole. Too many layers! Too many levels!” (AG, p 147). In 1964, two years before he died, Giacometti painted a portrait of James Lord, and Lord took photos on each of the eighteen days that the artist painted, which reveal how the artist started afresh each day. “And so it continued for eighteen days, although the number of these could have been greater. Actually, the work had been completed the first day and note that I say the work and not the painting, for the latter would not have been completed even in ten years”, so a critic comments, recalling Giacometti’s own words about what impels him: “I have the feeling, or the hope, that I am making progress each day. That is what makes me work, compelled to understand the core of life. And to carry on, knowing that the closer one gets to the goal, the further it retracts. The distance between the model and myself tends to increase continually; the closer I get, the further away it moves. It’s an endless search. Every time I work I am prepared to undo without the slightest hesitation the work done the day before, as each day I feel I am seeing further” (AG, p 151). The women are motionless, the men walk. The figures, worked and reworked by his nervous fingers, actually disappear as figures if you get too close. The women seem to be on guard both in the sense of defending their own space and protecting something. They seem to stand both as the accused and the judge. 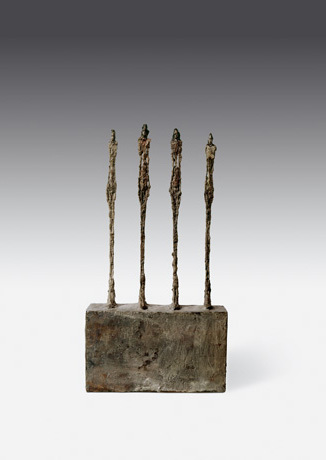 Giacometti’s artistic way of working and his figures speak of the individual’s loneliness and the difficulty of entering into the reality of another person. He recalls in an interview that the first drawing he remembers doing as a child was of Snow White in a glass coffin with the seven dwarves (AG, p 139). I see this figure in all his thin women, I see it as the held form of the human being, which cannot be woken by the dwarves. They watch over her and place her in the glass coffin – the screen which separates but also reminds. The artist is the one who hopes to waken her, or at least reach her in her stillness and almost immaterial uprightness from which most of the substance has gone into dust. In the end the wicked queen will dance her way to her death in the red hot shoes at the wedding she could not keep away from. She cannot truly see. So Alberto Giacometti, out of his longing for contact, reaches out to this hidden spirit core of the archetype, this spine of loneliness. Alberto Giacometti said of himself “I prefer to live in hotels, cafes, just passing through”. His figures are stripped to the utmost of the comfort of the body, as he was of house and possessions. Let me bring in Giacometti’s companion, Henry Moore, born three years earlier in 1898 and living twenty years longer to die in 1986. There are some external similarities in their artistic careers, a period for both in their thirties when they, it seems to me, become drawn into a clever, more intellectual art, influenced by surrealism. For both men drawing was an important way back to figurative sculpture, Moore with his famous drawings of people sheltering in the Underground in London during air-raids in the Second World War. Here he found images of shelter, the people wrapped in blankets, within the safety of the cave and the tunnel. Henry Moore developed a method of drawing which he called ‘transformation’, beginning with only the desire to make lines and tones and shapes on the paper and allowing image and order to emerge out of the activity. There are photos of him drawing on the tube platforms and you can see the intensity of his observation working with this letting go into imaginative transformation. This is the path towards the archetype. If Giacometti is the sculptor of attenuated verticality, Henry Moore is the sculptor of weight, certainty, strength. He is the sculptor not of the isolated woman or groups of figures like trees next to each other (Giacometti) but, of the mother and child. If Giocametti’s figures disappear, Henry Moore’s can become landscapes. The mother and child composition, as an entity, is an image of a sheltering environment and typically his figures are either themselves this environment or become real in bringing this quality of shelter to the environment in which they rest. Often his sculptures belong outside, animating a landscape. Giacometti’s figures come out of and also create a void around them. Jean Genet wrote of Giacometti’s sculptures that they withdraw so far that “they are mistaken with death… Giacometti is not working for his contemporaries, not for future generations: he is creating statues to at last delight the dead” (AG, p 108). I would say, rather, to acknowledge the presence of the spirit. 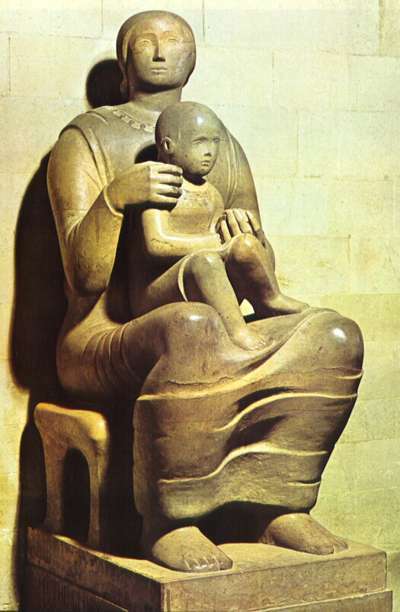 In 1943 Henry Moore carved a Madonna and child for St Matthew’s Church in Northampton. I find it very beautiful, the solidity speaking of spiritual strength, the carved form still in devoted responsibility. Henry Moore described the expression as one of ‘aloof mystery’. His sculptures often have holes in them, ways of seeing into them or through them: we move between interior and exterior spaces, in fact find the special space which D W Winicott called “Potential space”, the space which is between, and made by, mother and child, individual and the world around, the space which is not fixed spatially, in which the here-and-now mother shape can become a landscape, in which the figure shaped by Giacometti can be at the same moment tall and small, near and far away. This is the creative potential space in which we discover the archetype. In Moore’s later work the parts of the sculpted bodies of his huge female figures separate – knees and breasts are not held in a single whole by being part of one material block. I find, in the ones which work for me, this enlarges the sense of the wholeness, of the human form as an archetype of nourishment. It is strong enough to cope with spatial separation of the parts. These two artists, who have enriched my experience of the world, reveal polar qualities of this ‘potential space’ of transformation, in which reality and imagination meet. In Alberto Giacometti it is the individual in upright isolation, in Henry Moore it is the space of sustaining. The famous drawing from 1949, Henry Moore’s ‘Women Winding Wool’ (now in the Museum of Modern Art in New York), captures the dynamics of the connection between the two people. We do not see their faces: the connection is at the level of the heart and is deeper than the analysing eye would notice. 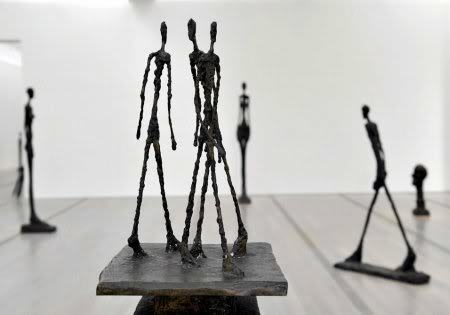 The act of winding connects the two figures in a movement which both stretches out into the world and draws back to the self, the self who, as Giacometti reveals, dwells in a lonely vertical. These are two elements in the human being which only come fully to be incorporated into us, as individuals, through our own activity. They express the paradox of our search for freedom – that our morality, today, is not something dependent on any law or authority. I want to do what seems right to me. Yet I know that I share a living space with others because, on what can be called a spiritual level, a level of ideas, we can experience a shared world from which my personal world is drawn. We live with an inherent experience of the archetype because of our thinking, but the realisation of our own individuality requires our own activity. We create our freedom out of the archetype. Karl König, in introducing a short series of lectures on ‘Eternal Childhood’, speaks of the human archetype as something we find in the child, and that our enjoyment of children, of remembering our own childhood, relates to the recalling of the archetype. Our maturing involves a loss: “For personal destiny and suffering have left their mark on us, have chiselled and formed us, and also malformed us. But if on the other hand we look at a child: light, listening, running, jumping, open, full of joy, we can imagine that this is indeed a lot nearer to what we might divine as an archetype of mankind” (E C, p 74). The child, Karl König describes, has the inborn developmental impulse to transform herself – this is the archetype. The adult is faced with achieving this ability, as a creative response to disappointment and suffering. With the Alexander Technique we are exploring how bodily experience, in movement and response, can be a medium for ongoing self-transforming. If we can re-enliven the experience of ourselves moving in space, making this not something dead and measurable, but belonging to our inner life, then we will overcome the divorce which deadens our perception of the world. On the one hand we think of our sensory experience of colour and sound etc. as unreal, inner images produced somewhere in our brains; on the other we are anxious to get behind our sensory experience and create a mathematical model of sight or hearing. We lose reality – we feel the screen which Giacometti felt between himself and the world. With something such as the Alexander Technique we are bringing our experience of space back into our inner life and allowing, then, all our sensory experience to be given back, as itself, to the world, a world we belong to. This is yet another way to see the verticality of the human being as a gesture of separation which makes a deeper connection possible. Two years after the first school inspired by Rudolf Steiner had begun, he gave a course of lectures to the teachers as they faced beginning a class with adolescents. In the first lecture he reminds his audience that teaching which directs “the child’s attention to something he is to look at or think about” (WEA, p 9) is sending the child towards a “waking-sleep activity… the child is in a sense, outside his body… when we get the children to sit still and think and consider, it is just the same as though we are calling up in their organism an activity that belongs to light sleep” (WEA, p 10). The educational activities in which the body is active generate an enhanced waking activity. Both support the other but Rudolf Steiner insists that if education is limited to study and observation “the children would, as they grow older, lead a dull and disheartened existence. They would grow into men and women who are bored with the world” (WEA, p 9). In the second lecture he contrasts our life in our legs and feet with our head-life. In the limbs, especially the legs, my will is active, directing “processes that are in themselves mechanical… I am outside myself, altogether merged in the objective world: I am become part of it” (WEA, p 22). By contrast, the head and its typical activities of sensing and thinking – do not belong to the world. “In respect of his head, man is apart from the world, he is isolated from it” (WEA, p 22). These two poles work together to constitute the human being. With this background I turn to the last lecture of this series in which Rudolf Steiner speaks of the crucial significance of the child having an inward experience of movement. He focuses on the time around the age of nine or ten when “the child is beginning to see himself in the world around him” (WEA, p 103). The world becomes a mirror. If the child has been allowed, through movement, and through avoiding undue intellectual development, to develop a sense of felt connection to the world, then this transformation into a heightened self-consciousness at around age nine or ten will be sustained by the child’s vitality on through adolescence. If not, if the bodily inwardness has been extinguished, then the child misses this important crisis – “And the consequence is that it passes instead into the bodily nature and stays there. What should by rights be in the consciousness works disturbingly from below, changing there into feelings and impulses… of which they have no knowledge. They carry on and live their life: but they can find nothing in life, it is empty for them” (WEA, p 104). Rudolf Steiner is describing the developing child returning to the discovery of a sense of self and repeatedly being offered the chance to deepen it. This nine-year old crisis could be called the crisis of wonder, of the feeling for beauty which both allows the child to find beauty in the world, and to find himself in the world. Paradoxically it is also the preparation for the acceptance of what we call faults or failings both in ourself and others. To cope with this crisis the child needs to know movement from within, as something more than mechanical action. It is possible to reduce movement to mechanical efficiency, even in terms of sporting prowess or physical fitness, but this will turn the world into a mirror which shows nothing to the inquiring child, or into a stimulus to self-absorption. The child needs soulful motion. 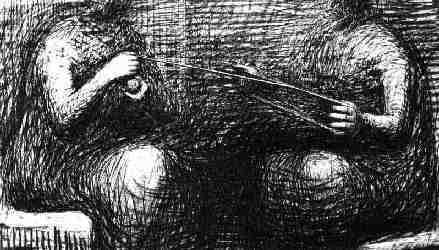 To go back to the mystery of the drawing by Henry Moore of ‘Women Winding Wool’. The movement is a lemniscate (the word means a garland of ribbons), a figure of eight, a movement which speaks both of the roundness of the head and the radiating lines of the limbs. The drawing as a whole focuses on the middle, the hearts, of the two women, the place where these two polar tendencies of the human archetype are drawn together by a condition which carries them both. This rhythmical middle, because its nature is not fixed, but is not beyond immediate experience, tells us most directly of the immaterial archetype. The rhythm of connection and separation leads us to know the solitude that belongs to the vertical spine, and the communion of our hands.